EcoFlight flew Clark Fork Coalition staff and a team from the Missoulian over the Bitterroot and Lolo Creek to asses 60 miles of river, looking at water levels, and to get an idea of how much and where irrigation is taking place along the streams. The following article and photos were a result of the flight. 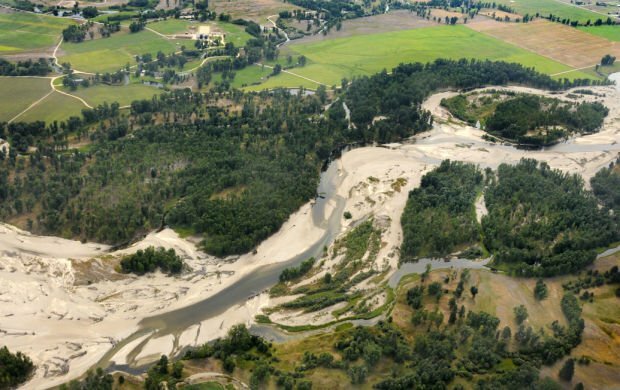 Low flows in the Bitterroot River between Stevensville and Victor leave sandbars exposed in areas normally covered by water in this aerial photograph taken Tuesday afternoon. The river, flowing at 230 cubic feet per second at Bell Crossing, is just a little over half of normal now and water users are expecting the level to drop as low as 175 cfs in the next month. Bitterroot River floaters better brace for some long drags as a tough water year heads toward the end of irrigation season. The usually multi-channeled river shows lots of sandbars and few braids as it flows past Hamilton, Stevensville and Florence. Lake Como’s reservoir looks like a dirtybathtub. The river gauge at Buckhouse Bridge south of Missoula reports 30-year low levels. Tributary streams like Lost Horse Creek and Burnt Fork Creek have almost nothing left for the river after the valley’s irrigators take care of their crops. Iman said many Bitterroot farmers switched to cereal crops that require less irrigation this spring in anticipation of a lean year. But those who raise corn, sorghum and hay will need another watering period soon. 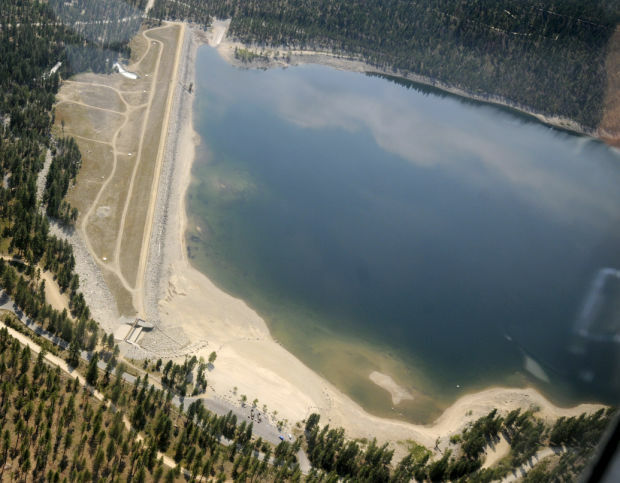 A combination of getting less than 70 percent of the average winter snowpack, a warm spring with a high-water peak of May 11, and about 20 days in June and July with temperatures over 90 degrees produced a trifecta of bad luck for the Bitterroot River drainage in 2013. The resulting bony river prompted the Montana Department of Fish, Wildlife and Parks to impose “hoot-owl” restrictions in the main stem of the river on July 23. That prohibits fishing between 2 p.m. and midnight when water temperatures are highest. The upper Clark Fork River between Perkins Lane and Flint Creek, and from its confluence with the Bitterroot west of Missoula to the Flathead River, is also under hoot-owl restrictions. FWP Region 2 fisheries manager Pat Saffel said the recent stretch of cool weather and August’s longer nights have actually helped fish in the Bitterroot. Irrigators have also not been taking their full allotments of water from the river, which has helped in-stream flows. What biologists have been seeing is a higher-than-usual mortality of cutthroat trout, especially in the waters above Hamilton. “The hoot-owl restrictions there were mainly for helping cutthroat, which are easy to catch and more sensitive to temperatures than rainbow or brown trout,” Saffel said. The Blackfoot River is still unrestricted for fishing, but it’s reaching a low-flow level that could affect ranchers and farmers there.